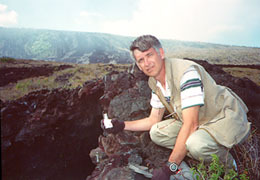 Forrest Mims has measured solar UV-B annually in Hawaii since 1992. Here he retrieves a tiny computer which automatically records UV-B for up to several days. The gloves protect his hands from the sharp lava.